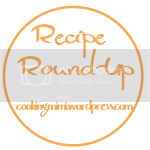 It’s time for me to showcase some of the delicious looking recipes I found during the week. I’m bringing you yet another complete meal. I’m starting the post with the good stuff- dessert. What deliciousness have you found this week? Micha that looks like a perfect full meal. Those look so yummy. Thank you for featuring my chicken! I’m so glad you liked it!